South Sudan's President Salva Kiir has ordered the army to halt all military operations, ahead of a full cease-fire that goes into effect Saturday. A presidential decree issued late Thursday also tells the Sudan People's Liberation Army (SPLA) to stay in their current positions and fire "only in self-defense when attacked." 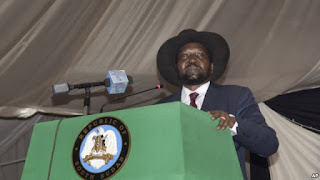 On Wednesday, Kiir signed a peace agreement with rebel forces in Juba, a week after rebel leader Riek Machar signed the agreement in Addis Ababa. President Kiir has expressed reservations about the deal, raising fears the cease-fire may not hold. However, there was no reported fighting in the country on Friday. On Tuesday, the United Nations Security Council threatened sanctions against South Sudan if Kiir failed to sign the agreement. The deal follows months of negotiations hosted by Ethiopia and several broken cease-fire agreements. Protesters held a march and vigil in Nigeria's capital on Thursday, the 500th day since more than 200 schoolgirls were kidnapped in Chibok by Boko Haram militants. Former President Goodluck Jonathan was criticized at home and abroad for his inability to end the Boko Haram insurgency. But three months into the term of his successor, Muhammadu Buhari, the militant group has stepped up attacks and the girls are still missing. Many critics are saying that while the new government is still settling in, there doesn't seem to be a sense of urgency about rescuing the girls. "Several people have been killed as a result of this insurgency in Nigeria. 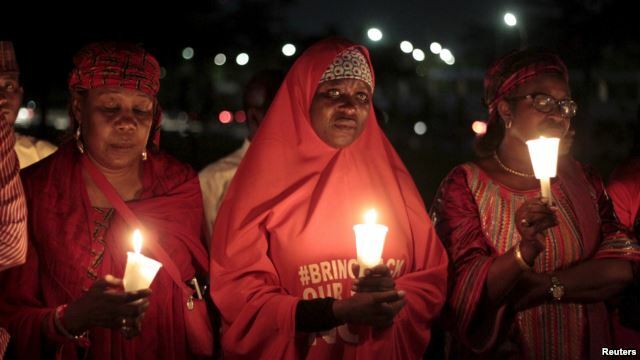 We are lighting this candle today in honor of every one of them," said Bukky Shonibare, a member of the Bring Back Our Girls social media and protest campaign. " ... We will keep the fire burning until [the schoolgirls] are brought back alive." Edith Yaseer, another member dressed in the campaign's signature red T-shirt and holding a candle at the Abuja vigil, said, "This light here signifies that we are still hopeful and we are going to continue to stand. We are hoping that we won’t have to stand for much longer, because we really want our girls to come back now, and alive." Omolola Adele-Oso of Act for Accountability told VOA that the “Enough is Enough” group that has been leading the charge on the issue in Lagos marched to the governor’s office to voice that little or no action had been taken since the girls were abducted. Adele-Oso praised Buhari’s recent decision to replace the heads of the army, navy and air force, saying that it was a step in the right direction in the fight against Boko Haram. However, she and others are waiting for a rescue mission. “Is this going to be a larger part in the campaign against Boko Haram? When are we actually going to put something tangible on the table to say this is what the action plan is to get them back to their families and their community?” she asked. The militant group kidnapped some 270 girls and women from a school in Chibok in April 2014. About 50 escaped, but the rest remain in captivity. Speaking at an event in Abuja alongside the country's vice president, U.N. Secretary-General Ban Ki-moon, who visited Nigeria this week, said, “The United Nations needs to have a strong partnership with Nigeria in peace, security, development and human rights.” He also called for the unconditional release of the remaining abducted schoolgirls. In Malawi, public hospitals have started giving patients one meal a day instead of the recommended three. This is largely because of financial difficulties facing the health sector. But health rights campaigners say the move is hazardous to the lives of the patients. The public hospitals have long been providing free meals to patients, three times a day; breakfast, lunch and supper. Now this has changed. The patients are getting one meal at 4 o’clock in the afternoon to keep them for the next 24 hours. “Some hospitals have started doing that because of the low levels of funding that we have at the moment. So we know there is that kind of ad hoc solution as they try to prioritize with the little funding that they have,” said the Ministry of Health spokesperson Adrian Chikumbe. Local media reports say almost all district hospitals across the country have resorted to a one-meal-a-day menu. Families of patients say the move is unwelcome. 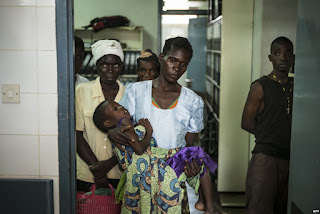 Mariam M’dala, whose husband is at Chiradzulu district hospital in southern Malawi, says that after learning about the change on the menu, they tried to send messages to relatives back home to bring some food, but they don’t have enough food due to low yields this year. M'dala says she sometimes relies on food brought by people who come to visit her sick husband or left over from other patients whose guardians themselves cook some food in the hospital kitchen. Sometimes, she says, the patient sleeps on an empty stomach. Chikumbe said that while the concerns are genuine, public hospitals are not necessarily meant to provide food to patients. “Our primary responsibilities are to treat the patients. And this is why when things were okay; we were contracting out the catering services because it’s not our core function [to provide food],” said Chikumbe. Juliana Lunguzi, the chairperson for the parliamentary committee on health, told VOA the food shortage situation in hospitals was expected. “When we were doing the budget on the health sector, only 25 percent of the money that was required was appropriated for the health budget. And when the actual budget was given to the DHOs [district health officers], it was less that 50 percent of what was needed. So I am not surprised that we don’t have food in the hospitals,” said Lunguzi. Health rights activist Martha Kwataine told VOA the food rationing contradicts advice doctors give to patients. “One would have expected that food is a priority because oftentimes when you go to the hospital the doctor would say ‘take this medication after a meal,’ because if you take medication on an empty belly it can be hazardous, some people develop ulcers, things of that nature,” she said. Malawi's government has been struggling to fund its operations after donors who have long been contributing 40 percent to the national budget suspended aid in 2013 in the midst of the government corruption scandal.